With the return of tens of thousands of U.S. servicemen and women from Iraq and Afghanistan, among other locales, American society today faces problems not experienced on the same scale since the post-Vietnam era. From the diagnosis and treatment of traumatic brain injuries and Post-Traumatic Stress Disorder to the retrieval and identification of human remains to the challenges of returning to civilian life in a time of economic and political turmoil, the issues facing American military veterans in 2012 are legion. 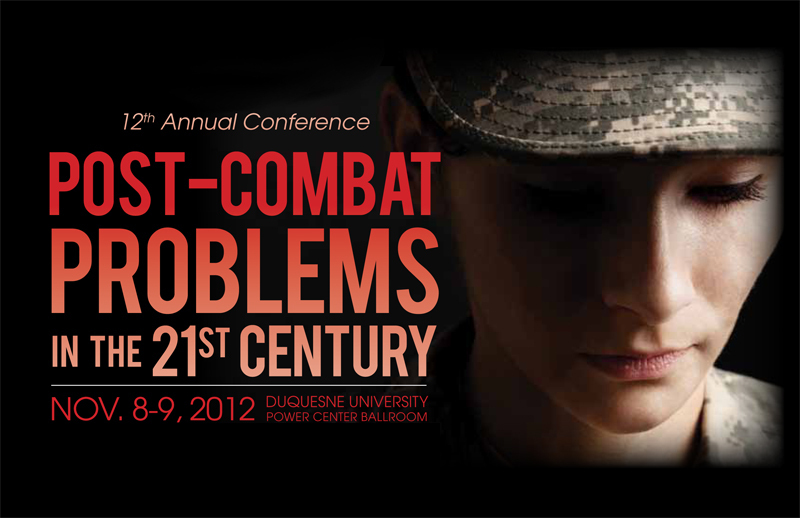 In consideration of the complex blend of medial, legal and public policy questions prompted by this topic, they Cyril H. Wecht Institute of Forensic Science and Law has selected as the theme of its 12th Annual Conference, "Post-Combat Problems in the 21st Century." Scheduled for Thursday, November 8 and Friday, November 9 in the Power Center Ballroom, the program will convene experts in such wide-ranging disciplines as psychology, DNA analysis, anthropology, occupational therapy, domestic abuse and criminal law.